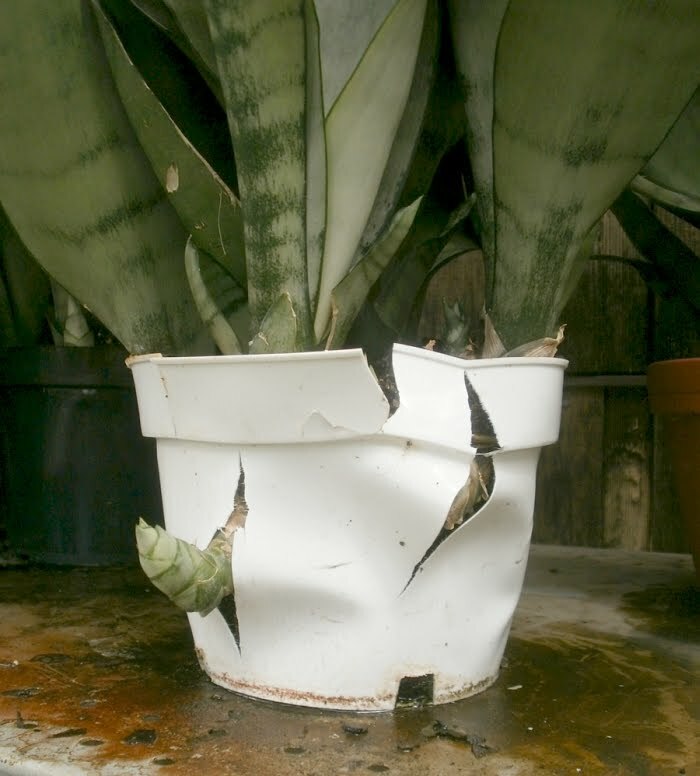 Sometimes you can wait a while to repot a plant, and sometimes it's sort of an emergency. And then every once in a while, it's kind of both at once. I just re-potted one of these for my boss. It was originally in a 1.5 foot diameter pot. I ended up making 10 similar sized pots. Not too much of a crisis. Those plants propagate quicker and more efficiently than rabbits. I dumped what I thought was a dead one into my compost heap (in the middle of TX summer) and it rebounded all by itself. Of course, I'd already written it off, so I euthanized it. That's how my grandmother's Aloe Vera looked. I should've taken a picture. By the time she repotted it there were four full Aloe plants growning in a 4 inch pot...and it was still growing new pups. LOL! 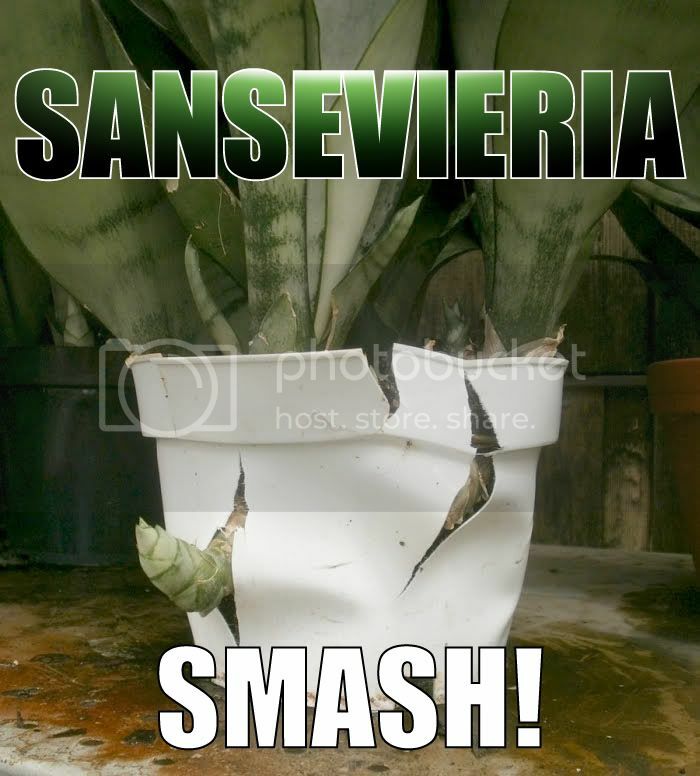 I love LOL Plants! Maybe this is the beginning of something big. LOL Plant Tuesday? No, it's too hard to come up with ideas after about the first 15-20 of them. But they pop up occasionally. 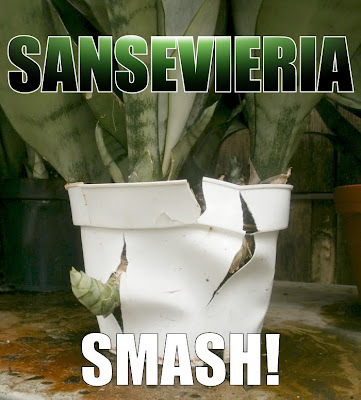 I just got my first Sansevieria ... I think "Moonbeam" sounds right ... yesterday. It's in a nice black ceramic pot now, and none of that crappy potting mix around it's roots. I'm worried, though, if I don't keep a better eye on it, I'm gonna hear the shattering of pottery one day. These guys have busted out of plenty of plastic pots at work! I have heard they can break expensive ceramic pots, too.